December 21st- Bonus Sock Day! Buy 3 Get 2 Free! -Earn 1 raffle ticket for every $50 purchased for a chance to win one of our themed stuffed stockings. Stockings to be raffled on Dec. 24th! -Purchases over $75 will receive one of our Dare To Be limited edition insulated totes! 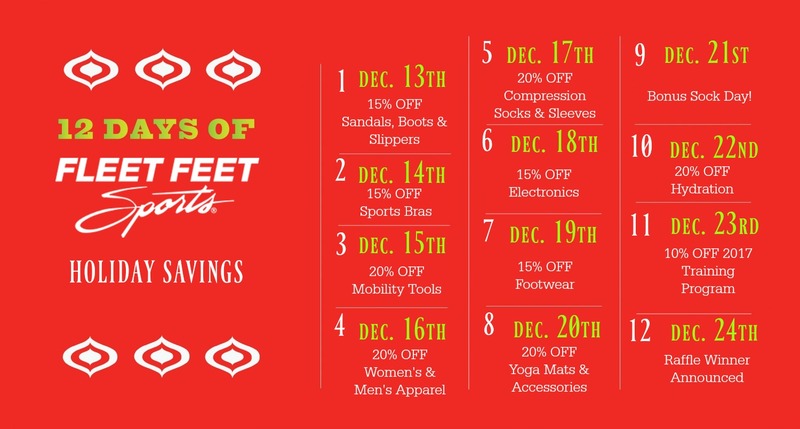 -Purchase a gift card for $125 or more in the month of December and receive $25 in Fleet Feet bucks for use at our Vacaville location. -Every gift card purchased in December will receive a 10% apparel coupon valid until 12/31/2016. -Don't forget our In Store Holiday Gift Registry- come in and pick out all of your favorite things so your loved ones know EXACTLY what is the perfect gift for you! -Free gift wrapping by one of our Fleet Feet Sports elves.